Sunday December 11 1910 We were very late with breakfast and I put in all the forenoon at house-work. I wrote and read in afternoon and evening. Weather bright but very cold. Monday December 12 1910 It was still cold. Will helped me wash and I cleaned the cellar floor before dinner. I wrote Mary Woolf and put in a letter I sent to Frank & Sophie. Worked on fancy work till late bed-time. 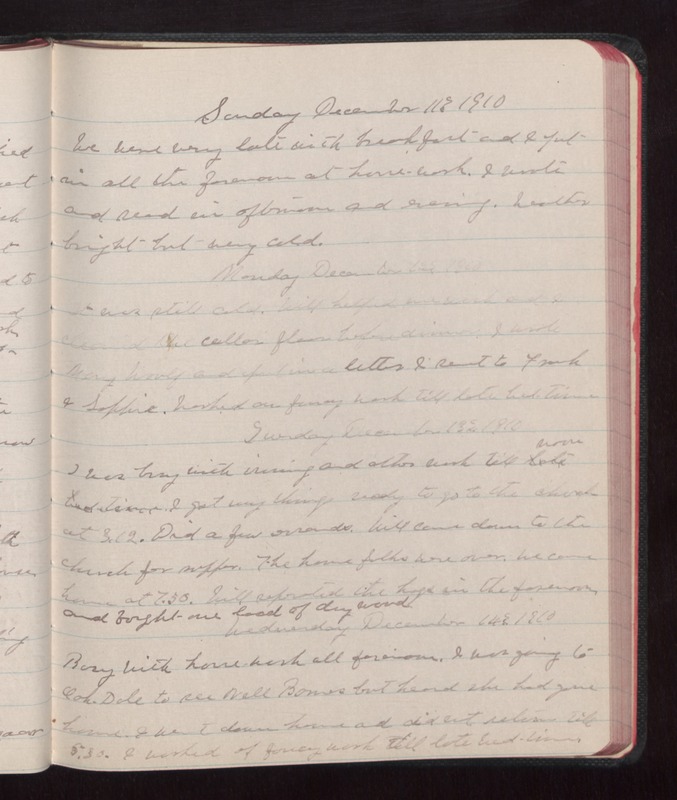 Tuesday December 13 1910 I was busy with ironing and other work till noon. I got my things ready to go to the church at 3.12. Did a few errands. Will came down to the church for supper. The home folks were over. We came home at 7.30. Will separated the hogs in the forenoon, and bought one load of dry wood. Wednesday December 14 1910 Busy with home work all forenoon. I was going to Oak Dale to see Nell [Bowers?] but heard she had gone home. I went down home and didnt return till 5.30. I worked of fancy work till late bed-time.